Rebound programme manager Sarah Clare, left, and Ronald McDonald House inventory Coordinator/Housekeeper Nikki Gamer with the last mattress to be collected from the charity to be recycled. 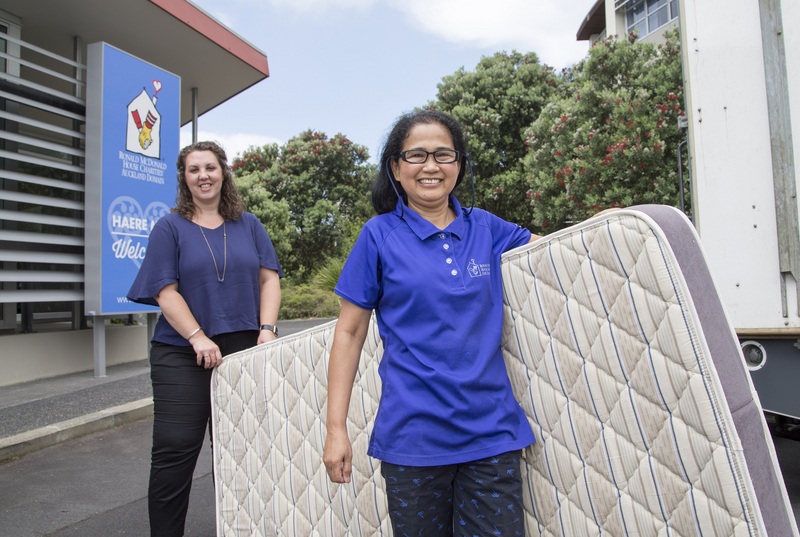 Management at Ronald McDonald House in Auckland will sleep easier knowing 43 mattresses from the charity have gone to be recycled rather than thrown in landfill. The last of the mattresses were collected on Thursday last week (November 30) by resource recovery specialists 3R Group as part of its Rebound mattress recycling programme. Rebound programme manager Sarah Clare says 3R was contacted by the charity and asked if it could help them responsibly dispose of their old mattresses, which were due to be changed for new ones. Rebound aims to be a product stewardship programme which will make the practice of sending mattresses and bases to landfill a thing of the past. It is still in the project phase, but has conducted successful collection and recycling trials. The free collection and recycling of the Ronald McDonald House mattresses was done as a social responsibility initiative, but also shows the need for a recycling programme, Sarah says. “Ronald McDonald House supports so many families by providing them with a safe haven during times of immense stress, we were really pleased to help them out. “The added bonus is that the mattresses get dismantled, in this case giving business to a local community trust, and the components recycled, rather than just going to landfill,” she says. Ronald McDonald House Charities New Zealand chief executive Wayne Howett says they work to embed environmental practices into all aspects of their operations, including reducing, reusing and recycling waste wherever possible. Every year Kiwis throw away an estimated 300,000 mattresses and bases. This despite the fact over 70 percent of the components can be recycled. Throwing mattresses away is not only a waste of resources but has other implications such as illegal dumping both for councils and charity stores. There are also health and safety issues for landfill operators, who find them difficult to deal with, and are a long-term problem in landfill – a particular nuisance for future methane gas extraction, Sarah says. A product stewardship programme will allow consumers to responsibly dispose of unwanted mattresses and bases.